I remember the first time I saw the Northern Lights. I was in Grade 8. It was an unusual night, very rare to ever see the lights dancing as far south as Lake Huron. I barely had to leave my own backyard. Fast forward 10 years when we would be living in Alaska and the opportunity to view the Northern Lights was more frequent, but always just as exciting. On nights of high auroral activity, it was not unusual to get a phone call or text in the middle of the night. "Get outside now! ", would be all I needed to hear from my friends. Waking up in the middle of the night, bundling up in winter gear and standing on the balcony was all worth the show the dancing lights were putting on. At first, it looks like nothing. Maybe just a fog in the sky. But then, as you stand watching in silence, its true colours emerge as it starts to dance across the midnight sky. Standing under that bright dancing curtain of light is a feeling like no other. 1. 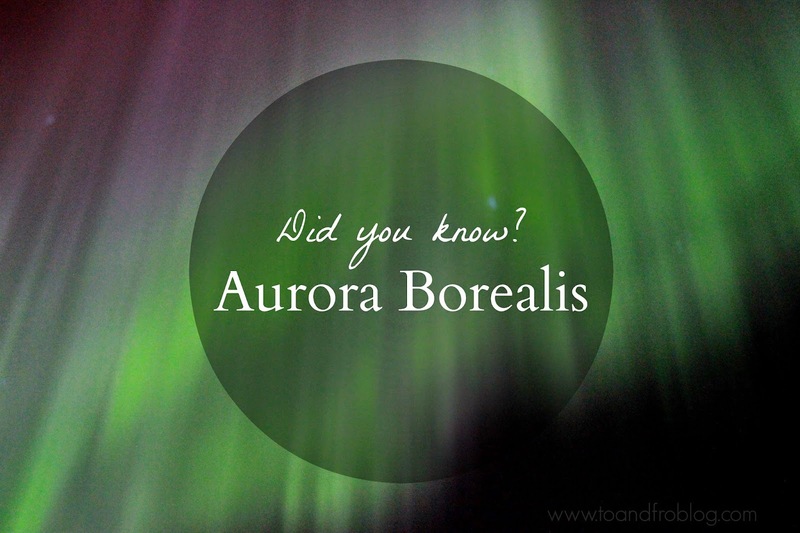 The Aurora Borealis, or Northern Lights, are named after the Roman goddess of the dawn, Aurora, and the Greek term for “wind of the north,” boreas. 2. Italian astronomer and philosopher Galileo Galilei was the first to describe the phenomenon as Aurora Borealis in 1619. 3. The bright dancing lights of the Aurora are actually collisions between electrically charged gaseous particles from the sun that enter the earth's atmosphere. 4. The colours depend on which gas is involved and how high in the ionosphere the reaction takes place. Blue and green lights are formed at lower altitudes while red colour comes from the highest altitudes and are produced by oxygen molecules. Nitrogen produces blue or purplish-red aurora. 5. No two Auroral displays can ever be the same. They are always of different patterns and colours. 6. The lights can also produce faint sounds such as claps, crackles, and static sounds. However, the noise is so rare that hearing it is possible only during times of maximum aurora activity, on windless nights away from other noise sources. 7. Auroras tend to be more frequent and spectacular during high solar sunspot activity, which cycles approximately 11 years. The last climax was in 2013. 8. Auroras follow solar cycles and tend to be more frequent in the late autumn and early spring. October, February and March are the best months for seeing them. The long periods of darkness and the frequency of clear nights provide many good opportunities to watch the auroral displays. 9. The best places to watch the lights in North America are in the northwestern parts of the continent, particularly the Yukon, Nunavut, Northwest Territories and Alaska. In other parts of the northern hemisphere, Auroral displays can also be seen over the southern tip of Greenland and Iceland, the northern coast of Norway and over the coastal waters north of Russia. 10. In very northern regions, the lights can occur at any time of the day, but we can’t see them unless it’s dark. Usually the best time of night to watch for displays is local midnight. 11. During intense solar storms, the lights become more spectacular and can sometimes be visible as far south as Louisiana, Texas or even Mexico and Cuba. 12. Clear skies are a requirement. Areas that are not subject to 'light pollution' are the best places to watch for the lights. 13. If you are flying on a night of high auroral activity, make sure to look out your window. The lights have been seen from airplanes. Astronauts on board the International Space Station are at the same altitude as the auroras and see them from the side. 14. The Aurora also occurs in the Southern hemisphere, but is called the Southern Lights or Aurora Australis. These can be seen from high southern latitudes in Antarctica, South America, New Zealand, and Australia. 15. Earth isn’t the only planet with auroral activity. Jupiter and Saturn have auroral ovals on both hemispheres. Interested in Auroral activity? The University of Alaska Fairbanks Geophysical Institute has an app for that. My girlfriends and I used to follow this app religiously when we were in Alaska. We didn't want to miss the show! Amazing! We went Northern Lights hunting in Iceland but failed to see them, so fingers crossed for the next expedition! Very, very interesting!!!!! This would be so amazing to see someday. Wow this was so interesting! I had no idea about well basically any of these facts. Every time I see the Northern Lights it is just as magical as the first time, they are so beautiful. So many interesting facts, I had no idea there were Southern Lights as well. Seeing the Northern Lights is on my bucket list, hopefully it'll happen one day. Okay Mother Nature, get to work on creating some intense solar storms so I can see me some northern lights from Texas! One of the reasons I love Alaska! Have you ever looked through the Instagram hashtag #AuroraChasers? There are some dedicated photographers that focus on tracking the Aurora's activity. Their shots are spectacular!